That's sounds familiar... 😊 PoM 2: Pipes of Mystery. Hello! Haven't posted in years, been reading a lot though. I noticed something with the Star Wars construction and I want others opinions. See the diagram of the Shanghai Pirates ride, look specifically at the section titled "Going Under Water". 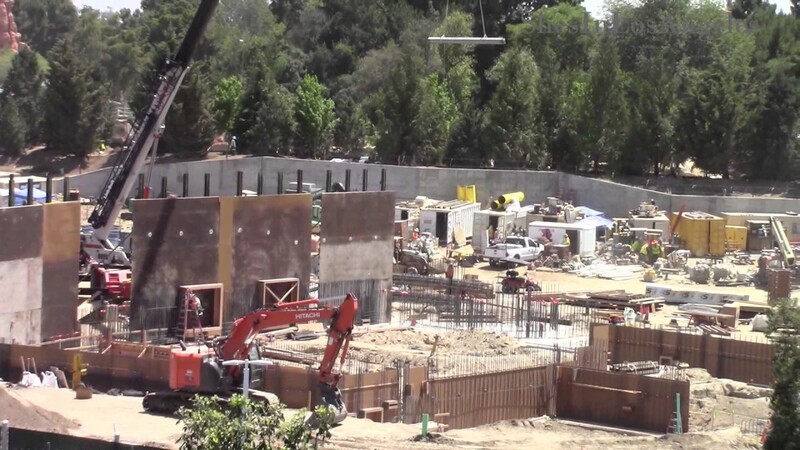 Compare that to the screen grab I took from a Fresh Baked Star Wars Construction video. Do you see the similarities? I'm totally speculating here, but I think the ride system may be similar to POTC in Shanghai, if I were to make a bet it would be without the water. I don't believe that ride system requires water to function. Could this round structure in SWL be a portion of the ride where you move around a projected image while in your ride vehicle? Thoughts? Last edited by disneyland55; 04-21-2017, 03:58 PM. Add me to the "not for water" camp. If the pipes were for water wouldn't they be PVC? I'm not in construction, it's just a guess. Can't wait to see what they do with them! disneylandd55: I like your idea. However, (and someone else can probably answer better than myself) I think the last aerial shot of the land showed the same round structure mirrored in an area that we can't see from the parking garage (kind of like there might be duplicate show buildings). That might be an argument against your idea. Can someone else clarify that? Am I remembering that correctly? Water pipes are usually metal because they are under pressure. PVC is used for drains and in other low pressure situations. In regard to DL55's post, I believe they were talking about the Battle Escape attraction, while you were talking about the Millenium Falcon attraction. The BE attraction has the round structure that is west of the big pit that many of us are guessing is for an elevator system. The MF attraction has two round foundations and it appears that there will be two more built soon nearby as you said. I think it's very possible that that area will be some kind of in-the-round screen based scene that transitions us onto the elevators. It will be interesting to see if the elevators go both up and down or if there are elevation changes in the ride track as well. They way it's looking I'm thinking the elevators will be near the begining of the ride and the first physical sets will start of the second floor, but that's just a guess. But it would be neat if the ride has a couple of hills in it that bring you back down to the first floor, the hills add a fun little thrill to PotC. Last edited by Uncle Bob; 04-21-2017, 06:32 PM. Yes this is what I was referring to. I couldn't get the images to load properly. Thank you. Thanks for clarification with the attractions. Too many circles - I was confused! I hope you two are right. That sounds awesome! Metal is not always used for plumbing. I said PVC, but I was thinking more generally about "plastics". For example, my old house had PEX plumbing instead of copper pipes. Sorry for the misleading sentence. Anyway, I think what is most perplexing about the pipes is their crazy arrangement. It seems more sculptural than functional for plumbing. Either that, or they are planning some crazy hum-dinger of a water feature! I guess we'll find out soon enough. The speculation is fun, either way. I don't think it will reopen until the train/ROA reopen because they're still working on the new berm/rockwork for SWL. I can see them reopening earlier, only if severe crowding happens though. TBH I could see them opening Big Thunder Trail before the ROA and Train, they could easily push the walls back to the entrances to SWL. To be honest... I'm more interested in where this diagram came from! Very cool! Is the full version available? This one is a bit cropped. Another new SILA video from yesterday 4/21/17...thanks to Jane for keeping us up to date with these great videos! I was guessing we would get a multi-level BE attraction using the same "amphibious" vehicles. These would be Star Wars-y and not POTC-y. I also assumed like disneyland55 , that these newer generations of trackless don't require water. I can envision what someone else said (pages back) of a scene that involves water. They said trash compactor scene, I agree, so fun, but even a flooded utility room would work with burst water pipes, fire, total mayhem. As I understand it, the SDL POTC has a dry segment in the dark. The backward drop. While the bottom of the drop is a wet area, the actual controlled slide is dry. 90% wet ride thru with a 10% dry area?? Our BE could be just the opposite. Something interesting to speculate on. In the latest video from SILA (thank you, Jane! ), at the 13:50 mark or so, there is a closeup of some of the latest added steel. That new addition is unique in that it doesn't go all the way up to the roof line and stop4s just halfway. If you look at the vertical frameworks elsewhere in the overall structure, all of those vertical beams were a single piece and it doesn't appear that the verticals in this new lower area have a connection point on the top suitable for extending them higher. Nor does that area have the immediate appearance of a roof. Also, the arced steel horizontal framework visible in the shot looks intriguing. 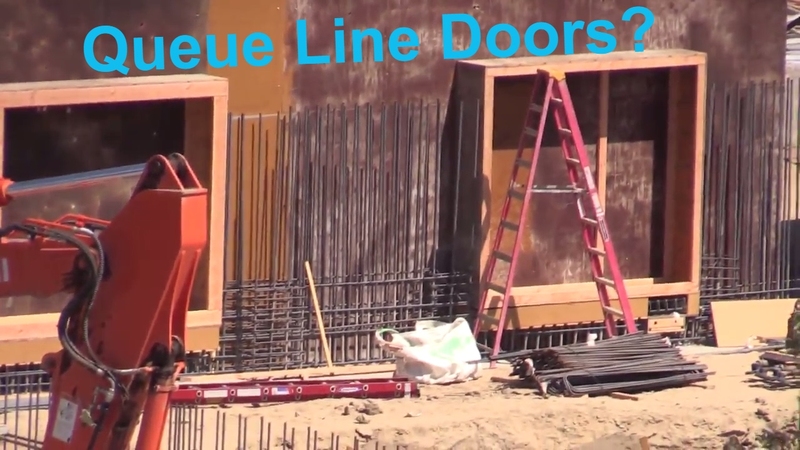 Not sure it's easily visible in her video, but in Disneygeek's photo update from yesterday, you can clearly see lateral understructure going from that fat main horizontal beam in the foreground and connecting to the curved framework. It has the appearance of creating a sunken floor in that location, like a pool. I'm curious to see what happens there. Shanghai Pirates is not trackless. I can see them using their tracked system on Battle Escape, but I lean toward completely trackless based on what the animatic looked liked. If that animatic is correct, there will be a droid driving the vehicles. A queue is a line, so that's painful to read, haha. But anyway, when they first start building those, judging from the worker standing near them, they were only 6 feet high, which is not enough. Or maybe I didn't judge the height well. There may well be more framing added to the top of the existing rectangular frames, before other side of the forms are placed and the concrete is poured. In that way, the 'doorways' could be considerably more than six feel tall. For example, if the doorways are going to be arched, bow-shaped frames would have to be added on top of the rectangular frames. I'm not going to hold Disney to this date. The Last Jedi was also planned for May but was pushed back to December. OT: *It should be noted that Avengers 4, will be released 3 WEEKS BEFORE IX. Last time they did this in 2015, Avengers 2 did well, Tomorrowland bombed. Not saying one of those will bomb, but Disney may have 2nd thoughts. Oh, oops. I thought Shanghai POTC they were differently shaped and upgraded versions of Aquatopia vehicles from Tokyo. Well let's be fair about this. Tomorrowland wasn't any good. And also it wasn't Star Wars. As much as people love Marvel, Marvel is insignificant to the power of dark side. People will flock to Star Wars over any comic book movie.